Education and Experience: the best of both worlds. At Bravo Fido, we go above and beyond to keep ourselves educated and up to date with the latest behavioral science. There are actually no standards in the field of dog training but we believe there should be. As our clients, you deserve the best and you will get it! Jennifer is certified by the prestigious Academy for Dog Trainers and holds a master’s degree in animal behavior and welfare from the University of Guelph. 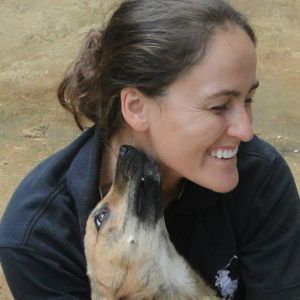 Through extensive field work in shelters, including managing an emergency shelter for animal victims of cruelty, she has gained considerable experience with a wide range of dog behaviour. Jennifer is constantly upgrading her skills through seminars and conferences. She has a special interest in puppy development and fearful dogs. Jennifer is also an avid traveler and whenever possible marries animal work with her globe-trotting interests. She has trained horses in Cambodia, volunteered with street dogs in Thailand and released howler monkeys in Belize. I did and began working in rescue and sheltering with the goal to fix it all. After a few years I realized the biggest impact I could have in animal welfare was to reduce the need for shelters by helping dogs and people live together harmoniously. Behaviour problems often stem from misconceptions regarding animal behaviour. Proper knowledge and technique keeps dogs in their families and helps rehome shelter animals. As an added bonus, I think dogs are super fun and I have been captivated by them from a young age! As a child, I would beg the neighbors to let me take their dogs on walks until luck and persistence finally wore my parents down and we got one of our own. A side note on puppies: while managing the emergency shelter for puppy mill dogs, I worked with many, many litters! I became intrigued by puppy development. You might be surprised, but adult dogs had always been my focus before this. The amount of time I have spent modifying adult dog fear problems has convinced me that “an ounce of prevention is worth a pound of cure”. It’s not only fun but imperative to work with puppies! Sebastien has been working professionally as a dog trainer for over 5 years. He co-owned his own boarding kennel and has given hundreds of hours of group classes. He was mentored by Patrice Robert, one of Quebec’s top behaviourists. 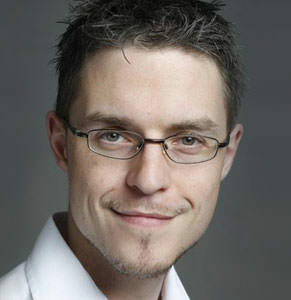 He has worked as a behaviour evaluator at the Montreal SPCA and for Humane Society International. He serves as an expert in canine legal cases. Sebastien partnered with Les Chiens Togo, a local organization training assistance dogs, and taught canine behavior at Le Centre L’Authentique through their zootherapy program. Addicted to faster results for dogs and humans, Sebastien is trained in TAG teach, which uses positive reinforcement to help people acquire new skills quickly and without pressure. I’ve always loved dogs and as far as I can remember, have done everything in my power to be around them. You know that guy in a party who spends all his time playing with your dog? That’s me. So the love affair with dogs dates back years but the fascination with behaviour started on a very defining moment: when the family dog bit me. See, we had a special dog. Rosko was a big, strong German shepherd and he had a major quirk: he got very angry when we left home and he had to stay behind. So much so that he would physically prevent us from leaving the house. One morning, he cornered me by the door as I tried to leave for school, bared a set of impressive teeth, growled (that deep, belly growl that spells trouble) and pounced. He gave my arm a good squeeze and let me go. Now that bite scared me, for sure but most of all, it made me wonder: why had this happened? This question drove me, many years later, to become a dog trainer. I know, now, why Rosko bit me all those years back and I made it my job to help people avoid such conflict with their dogs. Years in the field taught me the value of proper understanding and communication with our pet dogs and nothing brings me more pleasure than to see fluid, happy relationships between dogs and their humans. From rags to riches! Googly was born in a puppy mill. In fact, he was one of the Paws R Us dogs which turned out to be the largest seizure of dogs in Quebec. But lucky for Googly, this is where he met Jen (to this day Jen says she is the lucky one!). Googly came with his challenges – he had never seen the outside world. 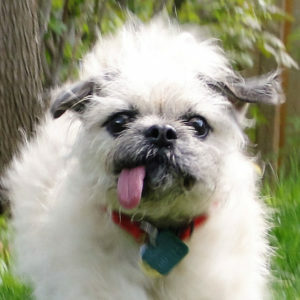 Googly taught Jen about the hardships of dealing with a scared dog but also the joy of helping a challenged dog blossom. These days few people can tell that Googly was born in such a terrible place. With his outgoing personality and unique looks, Googly has become a celebrity in his own right! Does your tongue always stick out? Yes, unless I am really scared in which case I try my hardest to pull it in. Do your looks bother you? Absolutely not. It just means I can bring more smiles to people’s faces. Check our blog for future Googlyisms. A distinguished gentleman! Murphy is the quintessential family dog. Overly social, comfortable in any environment, quick to adapt to any circumstances. Murphy is the poster child for proper socialization and good genetics. He is also a rescue, proving you can find wonderful dogs in the shelter system. At 11 years old, Murphy is retired. However, he spent many years of service as a puppy nanny, teaching the ropes to countless young pups at a dog daycare. Nowadays, he is teaching his humans all about aging gracefully. Stay tuned for bits of wisdom from the wise old dog! Our resident linebacker! Cookie came from a hard luck situation. Born into a deprived environment from an abused and highly stressed mother, Cookie came into this world at a huge disadvantage. She is a perfect example of why genetics and early socialization are so important. 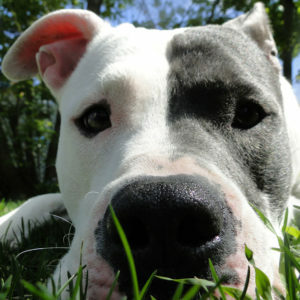 True to pitbull nature, Cookie loves to snuggle and play with gusto! However, the world is a scary place to this sensitive girl. Cookie has helped Sebastien understand the reactive dog, refine his treatment protocols and empathize with clients dealing with the same issues. *There is actually no protected use of this term. Any trainer can use it any way they wish. The only way to know for certain is to ask. Why Did We Start Bravo Fido? 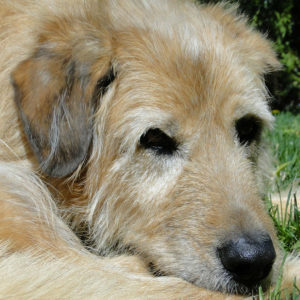 There are so many myths and misconceptions in the field of dog training. We wish to bring efficiency and clarity to dogs and their owners. We also believe dog training should be fun and effective for owner and dog. Sharing a common vision of what dog training could be, we decided to team up. For decades, the field of dog training has been obfuscated unintentionally, through lack of knowledge and intentionally, through charlatanism. Our mission is to bring dog training into the 21st century. Transparent – We will be open and honest about our practices. We have the knowledge to understand why what we do works and will explain it to you if you are interested. Whenever possible we will use evidence based practices to assist our decisions and will be honest when we are using our best educated guess. Humane – We are respectful towards humans and dogs. Dog training should answer the needs of both parties including a dog’s need to engage in natural behaviour. We will always strive to use the least invasive techniques and tools to limit fallout. Effective – We maximize results and minimize the time it takes to train by constantly sharpening our teaching and training skills through continued education. We believe our clients have the right to dog training that is both humane and effective. They shouldn’t have to choose! Bravo Fido – Meet your Good dog today! According to Stanley Coren, the popularity of Fido as a generic dog name stems from the name of Abraham Lincoln’s dog, Fido. Abraham Lincoln, a well-known animal lover, had a special fondness for this dog. Sadly, Fido never made it to the White House but was left behind with very precise instructions for his care. Fido was to be allowed access to the house even if muddy, he was to be fed table scraps when he asked and was left with his very own sofa . He was even photographed at a time when photography was still in its infancy.